Photo Op with a Veggie Dog. 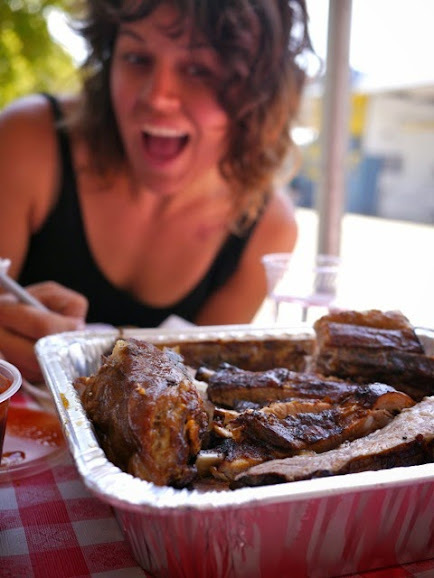 Cycling always works up an appetite and the Oaktown BBQ Bike Tour was no exception. Our tour guide was Dave Campbell, a local bike and BBQ afficionado. 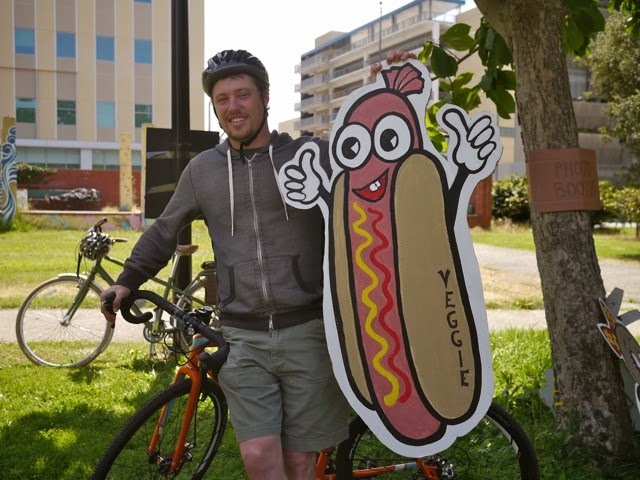 Dave is the advocacy director at Bike East Bay and one day he tantalized our office — and the entire block — by carting in a barrel smoker on a bike trailer and slow smoking a rack of ribs and heap of carnitas. 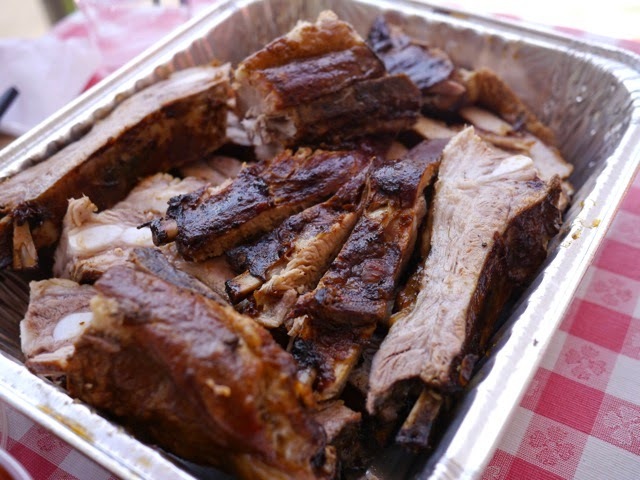 Ribs were our focus for the Oaktown BBQ Bike Tour. Dave kicked it off by introducing the Kansas City Barbecue Society scorecard. 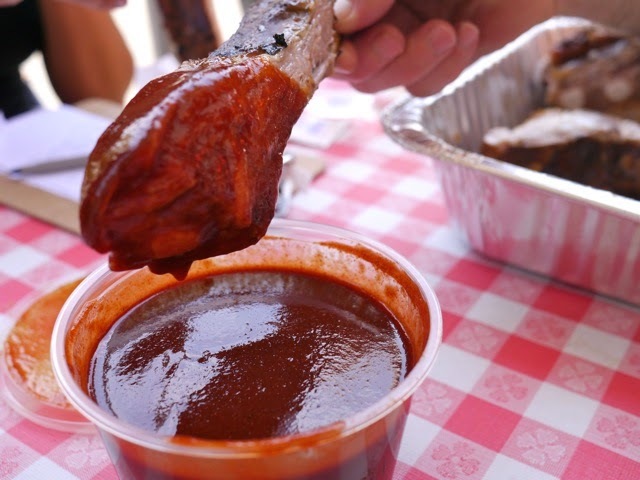 The KCBS sanctions BBQ competitions around the nation and has its judges undergo a strict certification to ensure the accurate classification of smoked meat according to Appearance, Taste and Tenderness. 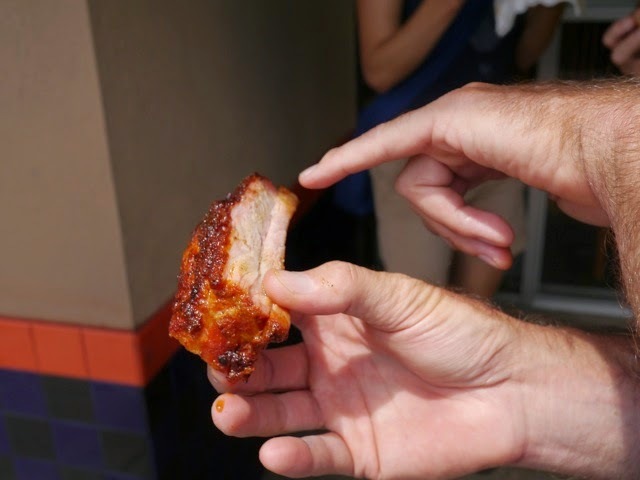 The first step to eating BBQ, we learned, is to look at it. Does it look juicy? Dry? Does it have that delectable red and orange sheen? Or is it glopped over in sauce? Dave identified the tell-tale pink color on the outer edge of a cut that comes from a long, slow smoke. Finally, then, you bite into it. 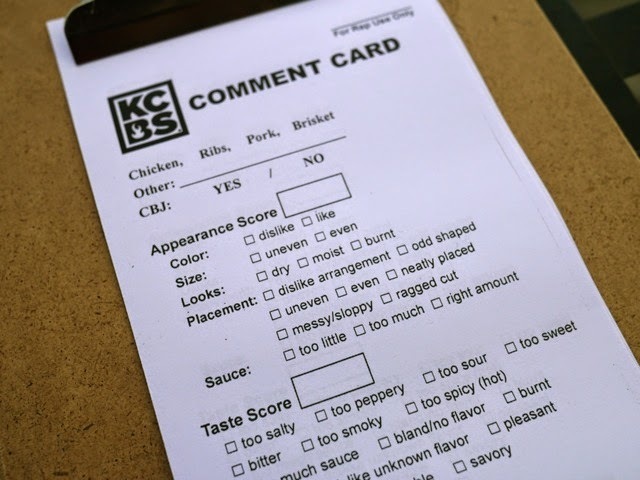 Kansas City Barbecue Society’s official score card! Our first stop, Phat Matt’s BBQ on Telegraph and 34th served up a platter of juicy, glistening ribs — probably the most visually perfect rib of our four stops. As we held up each meaty crescent for inspection, Dave described an optimally tender rib that’s falling off the bone, but not so tender that it’s mushy. You gotta have something to chew on, but not so chewy that it’s undercooked and tough. We were all besides ourselves — the rib was delicious — but Dave wisely had us reserve our highest marks until we’d surveyed a greater swath of BBQ land. The perfectly smoked rib at Phat Matt’s. 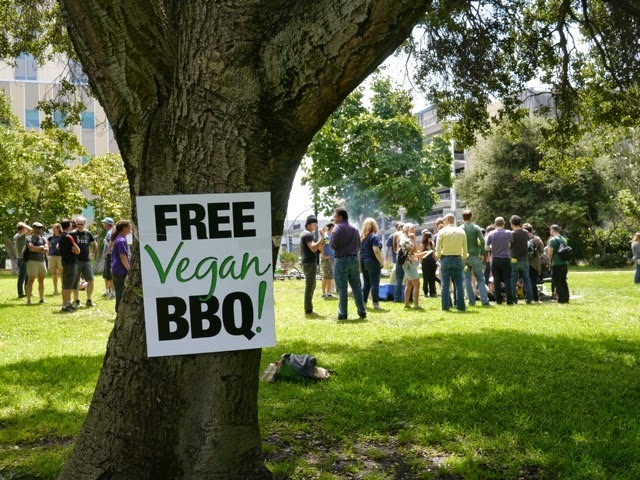 Next up, we crashed a Free Vegan BBQ in Mosswood Park. Our crew of a dozen cyclists cruised into Mosswood park, wiped the meat juice off our faces and got in line for veggie dogs. As we were passed flyers proclaiming factory farming awareness, I quickly realized this last minute addition to our tour was an intellectual detour. We downed our factory processed, previously frozen no-meat burgers (by KCBS criteria: chewy, savory, “dislike unknown flavor,” no bone to fall off of) and rallied on. We were ready for more meat. B-Side BBQ is a new addition to the local scene, a project of the famously tasty and always crowded Brown Sugar Kitchen. With designer decor and a full bar, B-Side was our most upscale barbecue venue of the trip. They served up a delicate morsel — a dark and smokey short rib so weak-willed it slid off the bone and into my mouth. Once inside, the flavors sublimated against my upper palate in tiny explosions of cumin and spice. It was good food, high food, fine food, but was it BBQ? If barbecue has a soul, then B-Side’s rib was definitely a Protestant — intellectual, well-argued and prim. 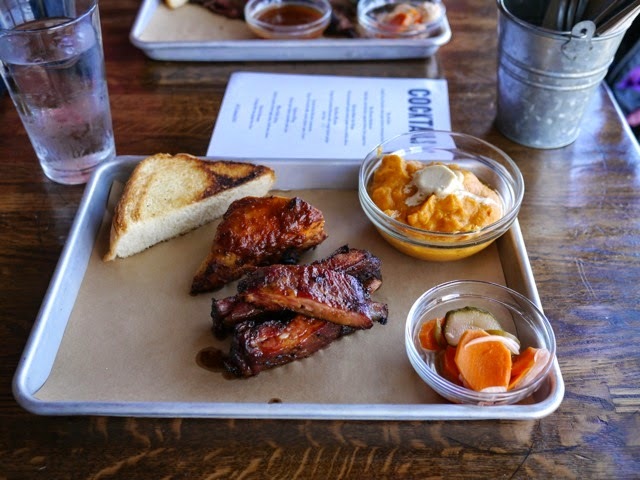 Fancy food upgrade: barbecue served cafeteria style at B-Side. Next stop, hallelujah! We crossed through Emeryville over to Smoke Berkeley, a BBQ joint on San Pablo Ave. Dave ordered up ribs and lemonade as we pulled up lawnchairs and cooled down in the mist that drifted over from the carwash next door. The stack of ribs piled up on a big aluminum tray was, by KCBS standards, ragged cut, odd shaped and the deep orange color of a Florida retiree, but how can I categorize the primal salivation induced by the dish? I grabbed a rib with both hands, inhaled its smokey aroma, tore off a hefty chunk with my teeth, savored its meaty flavor, double dipped into the thick vinegary sauce and sat back in my lawnchair satisfied. By god, this rib had soul and it was a revival tent preacher who shouts it to the rafters and has fried chicken and a Coke afterwards. Smoke Berkeley was my favorite joint overall — but scored the lowest overall! To all their own palate. Our last stop on the tour is hardly worth a mention for the ribs, but I will give a nod to the decor at KC’s BBQ, just down the street from Smoke Berkeley. The interior is adorable, packed full of old-style washing machines and radios like someone cleaned out their grandmother’s house and piled it all inside. The ribs however were bland and mushy like processed ham smothered in a sweet, ketchup-y sauce. A quotidian rib, but the crew ranked it second out of the four, just after B-Side BBQ, which served the most rarefied product. Eating barbecue with careful attention to the eye, nose and tongue appeal of a rib was a revelation. But the KCBS criteria of appearance, taste and tenderness is just based on a single plate of ribs, brisket or what have you. How would you judge a city or a region as a whole? In a single afternoon in Oakland and Berkeley, you can bike to more than half-a-dozen BBQ joints and eat yourself silly on as much ribs and brisket as you like. With extra points for its diversity of BBQ styles, laidback local proprietors and bicycle friendly streets, Oaktown hits the mark as a Bikes and BBQ culinary destination. 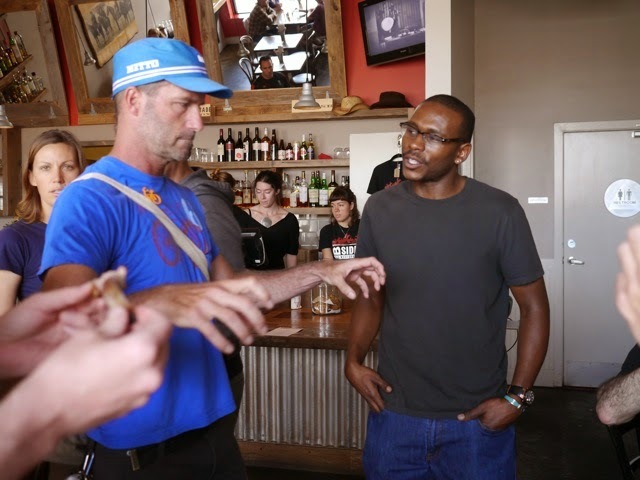 If you missed the Oaktown BBQ Bike Tour, you can still catch the Oaktown Throwdown BBQ Competition coming to Art and Soul on August 2. Dave is running the volunteer operation so sign on up (Dave at BikeEastBay dot org). You will be paid generously in pork. 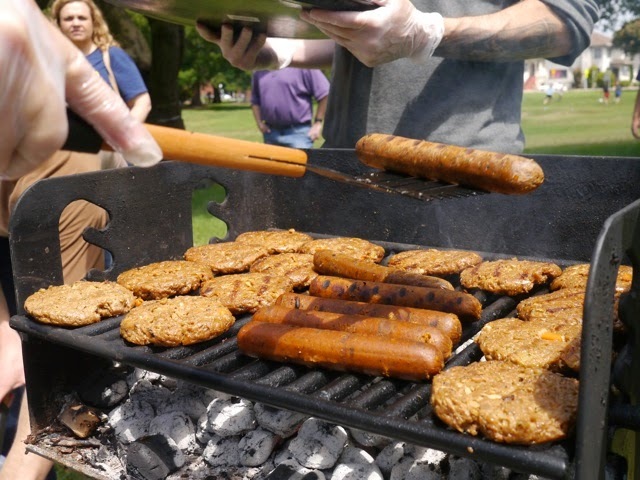 We wiped the gristle off our faces and crashed a vegan BBQ along the way. Dave explained however, that this is GRILLING and not barbecue. We sampled the no meat burger and tofu-dogs and then high tailed it before our carnivorous covers were blown. Dave (left) explains where on a pig the spare ribs come from while Terence, proprietor of the upscale and very tasty B-Side BBQ, looks on. Smoke Berkeley serves up a mess of ribs in the parking lot of a car wash.
With sauce on the side, you can dip to your delight. Smoke Berkeley’s sauce was the most vinegary of all we tasted but not my favorite. That would have been the spicy sauce at Phat Matt’s. One week later. 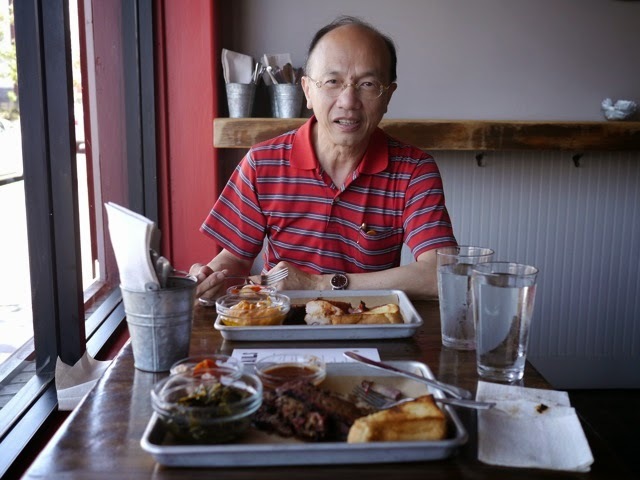 I decided I could eat BBQ again and brought my Dad to lunch to B-Side. Dad wanted a sampler so he had chicken and ribs, and I got brisket. The chicken breast was tender (a feat for any chef) and the brisket redolent of coriander. But you know what? It’s the thick cut Acme toast with butter that has me coming back.